Ten new scripts, f.ex one that allows you to design geometric shapes as aid for your sprites and art. Added Dennis' winning palette to the custom presets. Now I have written about 100 more or less useful scripts for different Color, Brush, Palette & Image operations. Luckily Grafx2-scripting allows for a simple window/menu system...so all the scripts can be launched from a single mainscript - The ToolBox, and this can be assigned to a key if desired. And you're welcome to try & use them if you like! Here's a zip-archive with the scripts and some instructions. Note that you may need a recent version of Grafx2 for all scripts to work (there's links in the instructions). Some scripts/algorithms are still WIP/Experimental...but that shouldn't stop you from having some fun. I'd love to see more people try some Grafx2 Lua-scripting! I swear, i'll try to make some lua, and i post here. Thanks for the awesome script, man! Do these scripts work on the Mac version? How does a non-geek add them? *The zip version link is not extracting on my Mac so I can't see what these directions are. Hm, the Mac-version of Grafx2 has been a long running problem, but I think the 2.3 version released in May should be ok!? If you have that one and it's working you should be able to run most Lua-scripts. Note however that new scripting features are frequently added and it's usually only the windows-version of Grafx2 that is released as betas. Some of my scripts use newer instructions that probably don't work with 6 month old versions of the program...but most scripts should still function fine I hope. Instruction how to install (just some moving/copying) the scripts are also in the readme.txt. The directory-structure is a bit different on Mac, zip-archive has been updated with new instructions. The difference between OSX and Linux/Windows is that the scripts directory is the directory Contents\Resources\scripts\ in the bundle, instead of (where_you_installed_it)/share/grafx2/scripts/. Other than that, it should behave similarly. I need to try these out right away. Thanks for making and sharing this! Oh yeah, I almost forgot about that recent change with "samples", I'm just using the old system with the root "libs"-dir. Figure I'll update the scripts some day with "dofile" so everything can fit in one drawer...but you know 100 scripts, phew! Thanx for the OSX info, I feared it would be different. Anyways, I updated the zip-archive with the recent installation-info and the missing memory-lib. (make a backup first, as this will replace the original files). Ok, thanx. First I was thinking it would be better to put the "libs" inside "dawn" and redo your process with new paths. But instead I could put the scripts in a sub-dir and put the toolbox-script alone in the root of "dawn"...just have to update the paths, but that's simply a textreplacement. This have to be the simplest and most userfriendly structure, right? UPDATE: Nope, that won't work as paths are relative to the inital script (the toolbox) and not any consequentally executed script. But it will work if the toolbox script is put back in the same place/level as the other scripts. Gh, now I start to think that I should have bought a smartphone. There is no way GrafX2 can be ported to J2ME, is there? You can buy a GP2X / Wiz /Caanoo, I think that's currently the best way to carry GrafX2 around. It could also be possible that there is a port of SDL for your dumb-phone's OS (I believe there's one for S60 for example) which might allow you to build it natively for your phone. Not a chance: my phone is Sony Ericsson Cedar -- it supports J2ME application only. Oh well, perhaps this is not a huge loss. Even if GrafX2 on my cellphone doubled the amount of my pixel productivity comparing to the present, it wouldn't make much difference, for I have 0 pixel-pieces in my private gallery right now. After a bit of search about this phone, I can't see any indication that it has a touchscreen. 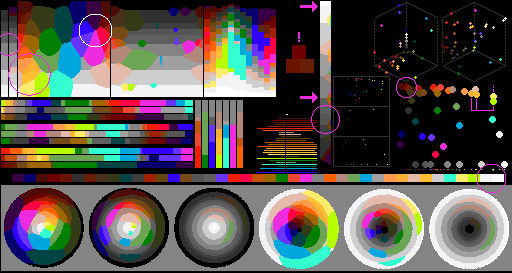 Grafx2 is mouse-oriented, and pretty useless on plaforms with no mouse or a *precise* stylus. Which script runs this palette analysis? Perhaps there is a really noobfriendly guide as to how to use these things, cause I really would like to make use of the 3D palette animation..
Actually, you know what, I did everything on the readme, and the folders don't show up in Grafx. My computer originally wouldn't open the .zip folder, so I force extracted the folders, then put them where the readme said, and... only the sample folder is there. I tried restarting and all that. @Pandora: Right-click the "Brush-effects / factory" button at the center-bottom menu, left of the text-tool. 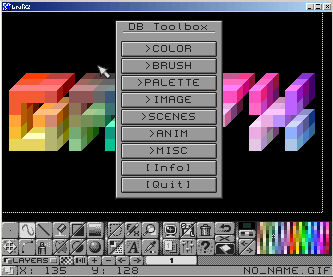 The 3D-Palette is bundled with Grafx2 (Samples2.4/Demo). @mdog95: What version of Grafx2 are you running? I just updated it to the latest today before I put the scripts in. You can try the newer version available from my profile page; you should be able to place them anywhere in your system (make a dir for them first, I forgot that) and run them from there. Assign a hot-key for ToolBox script (ex. Alt-1) for easy access. It still doesn't work. Is this the latest version, or is my computer screwing me again? Where did you put it? That's a fileselector, it shows what's there. You can navigate out of Grafx2 if needed. Now I have 2.4, and it's still not working. I still only get the sample_2.4. I don't know why the folders don't show up. Probably coz you haven't put anything there...go into the Grafx2 dirs with a filemanager and make sure. Or, if you're using the +1.2 version you can place the scripts anywhere and use the brushfactory-fileselector and navigate to wherever they are located on your computer. Just make sure that my "scripts" and "libs" are present at the same level. V1.3 released, see first post. I've noticed something weird in the online docs, when you click an image it zooms it, like +12.5% at a time, but after 3 times it zooms out 8 times smaller than original. A remainder of a time when each click zoomed +100% ? It works fine in IE and Opera but I do notice now that it now stopped working correctly in the last version of FireFox (there you go, another reason not to use that browser anymore...I've grown so tired of all the FF crap and constant changes that I only Opera nowdays). What browser do you use? Correct behaviour is, by each click from the original: +100%, +200%, +300%, +400%, reset to original. I'm doing this, don't know why it fails in FF. If I reload the page, the images are in browser cache, so it starts working correctly. Yeah, you're right. I've updated the online-version now to assign the zoom-feature after the page is completely loaded. Thanx. * Ping-Pong mode for the Sprite-Sheet Animator added, max frame size now 512x512. * Re-Tiler now allows 512x512, BG clearing. * A new Difference script that allows you to extract the difference of two images. I'm interested in these scripts (That's a lot of work right there.. Respect.). _DB_TOOLBOX is buggy on Linux. You are giving some filenames that are wrong (incorrect case). Ah, thanx for telling. It did occur to me the other day that some links had letters in the wrong case, but in windows it works fine, so I didn't sweat it. Though I'll be sure to fix this in the next update. And, no...no repository for these scripts other than my computer ;) But give me an e-mail and I can send you the latest version the SpriteSheet-animator or any other script you like. i download DBToolBox1.3. okay! good job! i load my pic. after i chose _DBTOOLBOX>Image>Distortions>fisheye. now i see message like "Error running script: bru_db_ColorSphere.lua:36: attempt to call global 'matchcolor2' (a nil value)"
how i can fix it? or what i did wrong? 1. Sorry, my fault...I mixed the lettercasing, the name of the physical script is "scn_db_Fisheye.lua" not "scn_db_FishEye.lua". Windows don't care so these (there are a few) wasn't noticed until recently. Will have this fixed in next version. For now you can either rename the script or edit the toolbox script (_DBTOOLBOX.lua). You can also run the script directly without going via the ToolBox. 2. Yeah, some of the scripts use new/wip features added to the Lua-scripting. I'm not sure if the latest Ubuntu versions has those implemented yet. But always get the latest version of Grafx2 for best compability. @Yrizoud: Ah, right...that's good to know. However in the case of matchcolor2 I would either have to re-route to matchcolor - which may give a different result, or use my own, very slow function which now also would require a palette-list to be generated at every call...effectively make it slit-your-throat slow. ...but maybe I could use this to present informative messages rather than having the scripts cryptically fail. What makes it complicated exactly? You can just assign the Toolbox to a shortkey, I hope you know. Or do you find the scripts themselves complicated (coz yes, some of them are quite cryptical esp. since there isn't much room for explanations). I'm getting pretty close to finish v1.4, so if there's anything ppl liked to see added or changed, now's the time to shout! If the library is designed for a recent v2.4wip, can you please use the new "run()" instead of "dofile()" ? It helps the scripts run on other OSes. Also, it doesn't have the same problem as dofile() with relative directories. ...There would be no need to change anything and it would be compatiable with older versions, right. (Running individual script directly would still use the real "dofile" however). Ok, that's a little weird as that's a pretty basic script. What's Grafx2 version are you running right now (I'm running 2.4.2035). If you'd like you could test the latest (unreleased) version of the Toolbox and see if it has the same problems. SVN r2062. Just to be sure I completely rebuilt and reinstalled GrafX2. No change in results. Of course I won't pass up any opportunity to get my hands on the latest Toolbox :D PM'd. This is probably just a workaround, as it seems to me that the backup buffer should already contain some kind of sensible content at the point you go to scale the image. Anyway, if you're experiencing this, it's a usable workaround if you only want to scale up. It doesn't work for scaling down..